The lodge enjoys a truly stunning location with imposing mountains towering overhead and tucked into the bush on the banks of the Komati River – you’ll never tire of the gorgeous views from wherever you are in camp! Wash the dust off after your morning game drive with an outside shower in the warm sun on your private deck – it really is an exhilarating experience that really makes you feel alive! 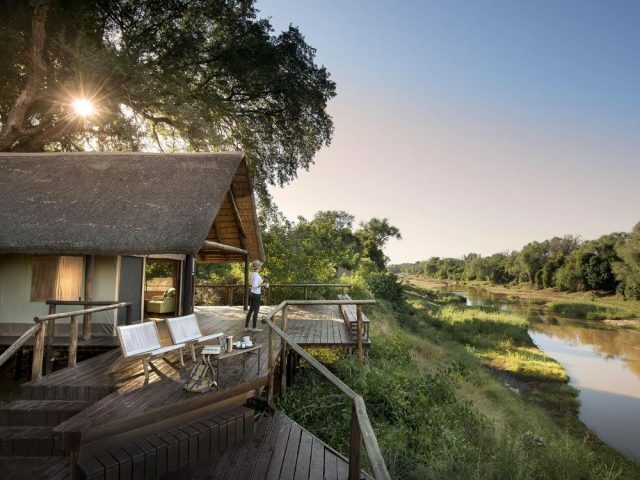 The reserve boasts attractive and varied scenery – from imposing mountains to vast open grassy plains and with a beautiful river thrown in for good measure! Upon entering the reserve, you’ll be picked up for the half hour transfer to the lodge itself which doubles up as a handy game drive as you travel through the wide-open grassy plains that dominate the southern sector of the 15000-hectare reserve. As you progress, you find the vista increasingly dominated by an impressive range of mountains. 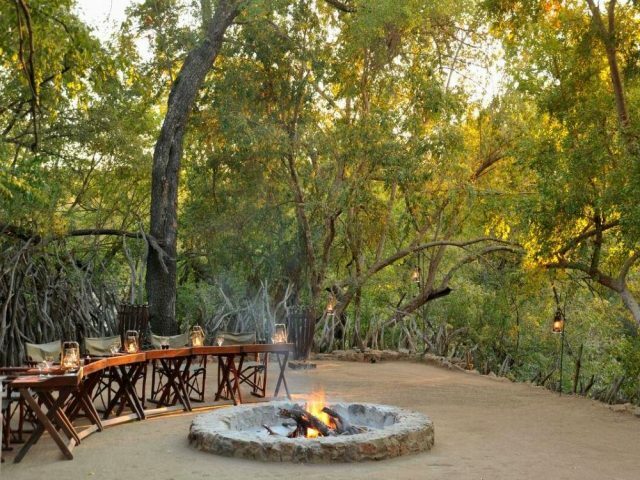 And it is at the base of these mountains, in a gorgeous riverside setting on the banks of the Komati River, that the camp is located. 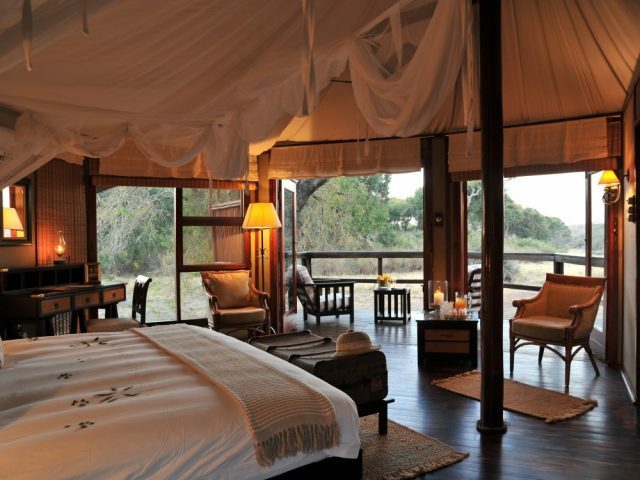 It truly enjoys one of the most stunningly beautiful settings of any game lodge in South Africa! With such a gorgeous location, it’s a good thing that the lodge that’s been built here matches the splendour of its surroundings! Just 10 tented suites accommodating a maximum of twenty guests at one time make up the lodge – and they’re some of the nicest tents we’ve come across in our travels. They’re an enticing combination of old-world style and elegance with modern touches that strikes just the right note. Boasting richly polished wooden flooring covered lavishly in Persian rugs, dashes of pastel green, greys and light reds provide an attractive colour palette. Natural hardwood furniture - mahogany dressers and side-tables polished to a bright gleam - lend a feeling of opulence to the rooms. One of the features we particularly loved was the indoor shower using an old zinc bath as a base in which you stand, a unique and witty touch that adds to the authentic feeling of staying in a traditional safari camp of bygone years. However, just because you’re in a tent it doesn’t mean you have to give up all the conveniences of the modern era. Ceiling fans and comfort cooling and heating keep the temperatures within a pleasant range, while a tea and coffee and station and a minibar provide hot and cold drinks as you require. But it’s when you venture onto your private outside deck overlooking the river that the “wow” factor really gets turned up to the max with an outdoor bath, outside shower and private plunge pool – we ended up spending the majority of our time relaxing here (and especially enjoyed the exhilarating feeling of showering in the great outdoors!) 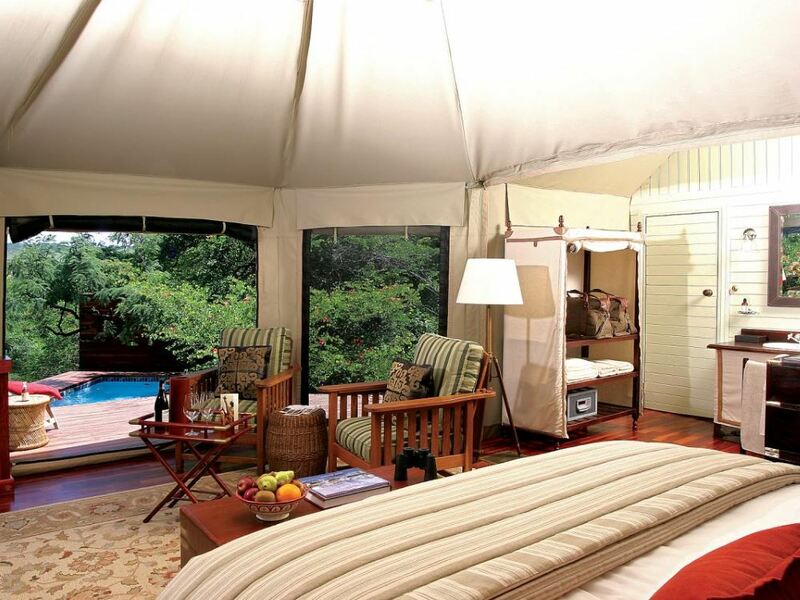 As an optional upgrade for that discerning guest who wants that little something extra, one of the ten tents is labelled “The Royal Tent” - this boats its own tented lounge area, the perfect place to relax and while away the hours between game drives in privacy. The rest of the lodge exhibits the same style tented structures as the rooms. You can relax in one of the comfy sofas in the lounge (or enjoy views out over the river from the outside deck) Our recommendation though would be to book a massage at the Spa perched just above the river where you’ll enjoy being pampered to a soundtrack of water tinkling over the rapids just outside! On our game drives through the reserve’s 15 000 hectares, 2 things struck us in particular: the reserve’s scenic variety and beauty, and the variety of animals that we saw. The landscapes here vary from impressive thickly vegetated mountains, almost 30 kilometres of river frontage as well as seemingly endless grassy plains that reminded us inevitably of the famous plains of East Africa. The only unfortunate jarring note in all of this scenic splendour was the presence of power and telephone lines which reminds you that this was previously farmland that is well on the way to becoming pristine wilderness again. The good news is that if you fancy doing more than the usual 2 daily game dives by 4X4, a number of interesting other options exist. Perhaps ditch the 4x4s for an afternoon and join one of the fully-qualified guides on a bush walk to discover the smaller, oft-missed beauties of the Nkomazi reserve. Alternatively, you can hop onto a mountain bike and go for a breath-taking cycle through the reserve. Not a cyclist? Why not laze the day away casting lines into the Komati that runs some 30 kilometres through the reserve (if you’ve never tried this, there isn’t a better opportunity to do so, since rangers will be there to show you a thing or two about the graceful art of fly fishing). After your dinner, the star gazing deck is the perfect place to enjoy a quiet nightcap and discover the profound beauty of the southern skies by night. 0 to 9 year olds are regrettably not allowed at Nkomazi Game Reserve, unless the entire camp is being booked for exclusive use. Child rates are applicable to children from 10 years up to and including 11 years at 50% of adult sharing rate. Children aged 10 to 11 years may join game drives at the discretion of the guide. 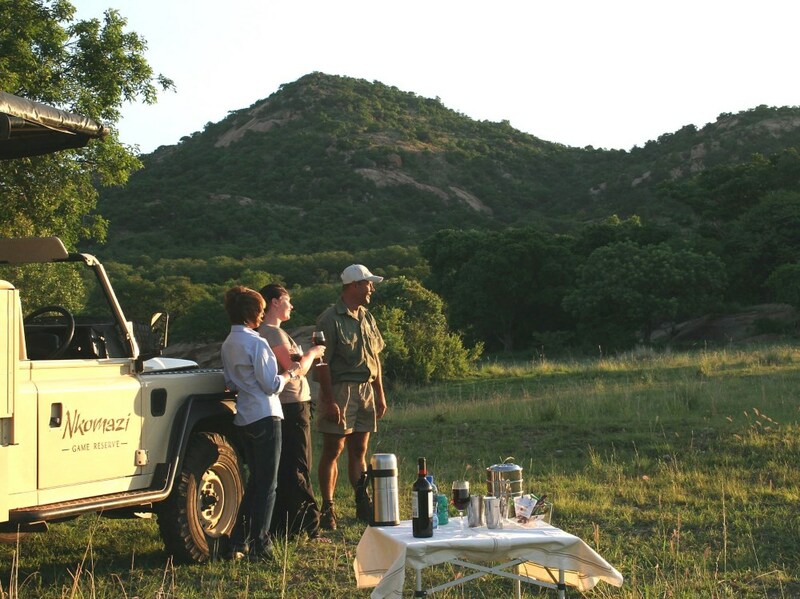 In the case of exclusive use - Children aged 6 to 11 years may join game drives at the discretion of the guide.